The toxic heavy metal found in some fish/shellfish that pregnant mothers and young children should avoid is mercury. There is a restriction for pregnant women and young children because it can be detrimental to neurological development of the children if it is ingested. However, pregnant do not have to avoid all fish, only the specified species with high concentrations of mercury. Amanda is safe eating the pan-seared tuna, because it is among the five common species with low traces of mercury. 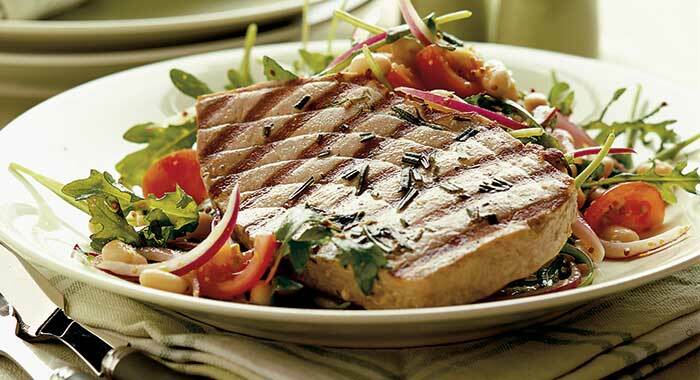 Fish should not be avoided altogether, it is a part of a healthy, balanced diet. Fish is an excellent source of protein and omega 3 fatty acids, which stimulate proper growth in children. Coal burning in power plants is the main human activity that leads to increased levels of mercury in the environment. When coal is burned, mercury is released into the air, which then enters the water. Small organisms such as krill and phytoplankton are the first to take in the mercury. 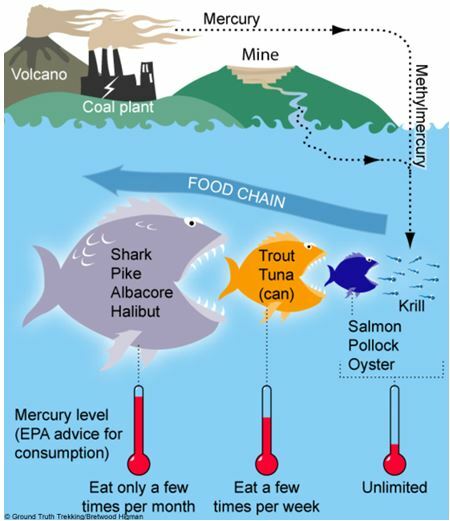 Through biomagnification, mercury works its way through the entire aquatic food chain, as seen in the picture below. The main culprits that have the most coal burning plants are Missouri, Arkansas, and Tennessee. The two species with that exceed the EPA's limit of mercury are the Spotted Bass, and the Largemouth Bass. Normally, the Trout's and Bass's mercury traces exceed 0.1 HG ug/g. Regarding the lower traces of mercury in humans, this may be so because the animal could have had trouble digesting/handling the amount of mercury in its body. You should still be cautious with Largemouth Bass you have caught from the lake, because it is ranked as one of the species with the highest level of mercury. Mercury is more prevalent in the samples of sediment, because it holds onto it better, as well as traps it inside rather than getting washed away. I have completed my research regarding the safety of eating fish while pregnant, and I have to say, it was very relieving. An EPA listing of fish that are safe to eat and ones to avoid stated that eating tuna is not detrimental to the baby's growth. They say to keep a balanced diet by eating a variety of seafood, but stay away from the species with high traces of mercury, like the Largemouth Bass and the Spotted Bass. I hope this information is as helpful to you as it was to me! One example of a toxin biomagnifying through an environment os the spread of DDT. It was sprayed by humans, but then the small scavenger animals consumed it. DDT worked its way through the food chain until it reached the Bald Eagles, which hindered them from laying eggs with strong enough shells to survive. Another substance that biomagnifies is cyanide. It enters the water and works its way through the aquatic ecosystem, causing miscarriage and paralysis in the affected organisms.